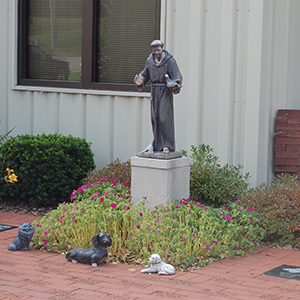 Ava’s Memorial Garden is situated at the entrance of the Quincy Humane Society located at 1705 North 36th Street in Quincy, Illinois. This is a place to honor a special person or memorialize a beloved pet while celebrating the lives of all animals that have found a second chance at life through the Quincy Humane Society. All proceeds from Ava’s Garden help support the shelter care and find homes for animals that do not have the love and support from someone like you. For more information or to honor a person or pet, please click on the below Ava’s Garden Order Form. A beautiful wooden pergola in Ava’s Garden with a dedication plaque affixed to the side. A cast stone bench features your message on a dedication affixed to the bench. Ornamental or Shade trees serve as a living tribute to the person or pet of your choice. A stake-mounted plaque displays your dedication. Your message with an image of your person or pet engraved and placed in the memorial garden.